The eastern side of of the Chartreuse Massif is protected by a band of cliffs stretching from Dent de Crolles in the south, to Mont Granier in the north. In some areas these cliffs are vertical, and in others they are a complex of largely inaccessible cirques and sangles, hiding a wonderland of hidden gems such as la Tour Percée. This walk provides another opportunity to get up close and personal with the area, and also provides a gentle introduction to sangle walking with some impressive rock scenery. It ascends the Pas de Belles Ombres, and then follows a sangle north below the eastern crête of l'Alpe before returning along the top of the crête, and descending by the ascent route (map). It's a lovely, gentle walk. The starting point is Pré Orcel (1045 m, grid ref. UTM 31T 72985 50340). This is reached from les Près along 4½ km of bumpy forest track. There is a large parking area, information boards, and a water source here. From the car park, take the path that heads up towards the col de l'Alpe between the two notice boards. This reaches the Cabane Forestière de l'Allier after 15 minutes. Continue up hill for another 15 minutes until the path climbs up a rocky slope. 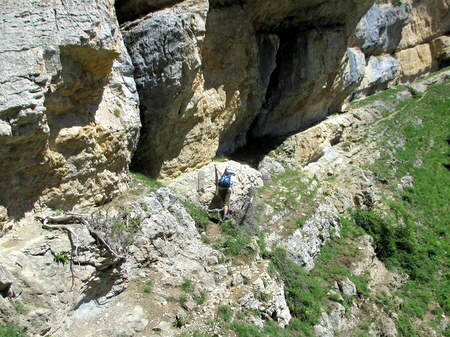 At the top of this a boulder with a blue arrow points up our ascent (although the path proper is in a further 10 metres). This is a pleasant and fairly easy ascent for 20 minutes marked with blue blobs. Just before the top a section of pavement is crossed, and then the path turns sharp right through a bit of a corridor into a grassy clearing with a cairn. From here, the main path turns up to the left to the col, but we carry straight on to find the sangle. The first 100 metres is a bit confused, but you'll soon pick up the path. The first section of the sangle is quite benign with shallow grassy slopes liberally dotted with trees below, but after half an hour the first of four impressive cirques is reached. The second cirque is even more impressive, with the path round looking quite hairy from a distance, but it proves to be quite straightforward. After the fourth rocky cirque the path descends a grassy slope for a little way to where a boulder with blue and yellow markings indicates the exit path to the crête above, which is just three minutes away. From here we return back south following a small path through the trees along the crest, with views down to the sangle we have just traversed and the south cliffs of Mont Granier looking surprisingly close. After half an hour the path breaks out of the trees to enter the meadows around the 1843 metre high point. This is a wonderful spot with some amazing views. Past here, the path re-enters the forest before emerging again onto a beautiful broad grassy ridge, and dropping down to a T-junction at the col. Turn left, and within a couple of minutes you'll be back on the route we ascended.